Everyone's a Rookie Before They're An All-Star! We found 7 episodes of Rookie Designer Podcast with the tag “freelance”. Carl and Jake get together this Monday morning to record their latest episode. Carl has some interesting insight about an article stating people are dying sooner due to having less trust and Jake talks about an upcoming Disney documentary. They then jump into Carl's topic Happystance. This is when a big, killer, well paying project almost seems like it fell right in your lap. They both share stories of Happystance just from this past week. Lastly they close out with their Rookie Recommendations for the week. Jake and Carl head into episode 178 without much of a topic on deck and decide to see what come up in conversations. They start off with some interested design news from Weight Watchers and a pretty crazy story about some Banksy artwork. Then it's on to see where things take them. Jake shares an interesting story about a video project he has been working on and it leads to a discussion about when things changes mid-project. Lastly they cover their Rookie Recommendations for the week. This week Carl and Jake are really excited to bring on Taughnee Golubović from Endeavor Creative for an interview. We have been really good friends and fellow creatives for many, many years. Taughnee shares a bit of her journey to get to where she is as a creative and also how she went from living in Alaska to living in Croatia. She also talks about how that effected her business and what she had to do to really change things up with her business to get it growing again. Her business adventures are what have inspired her new book Client Attraction Mindset. Be sure to listen all the way through as we have some exciting news! This week Jake and Carl talk about the importance of taking care of yourself, as much as taking care of your side gig, business, or school projects. It is easy to get into your creative flow and forget about what you are doing to make sure you don't approach burnout. They share some of the things they do to make sure it doesn't happen to them. Carl also shares his experiences at the HOW Design Live showroom floor. They also cover their Rookie Recommendations and a bit of Design News. In this latest episode Jake and Carl talk about what it is like to work with friends who want to be clients and also what things to watch out for when you become friends with your clients. They also have the weekly design news and Rookie Recommendations to share. Jake and Carl are back this week to discuss how they acquire new skills, figure out what those skills should be, and talk about a few skills they are currently working on. They also talk about a bit of design news and finish up with their Rookie Recommendations. 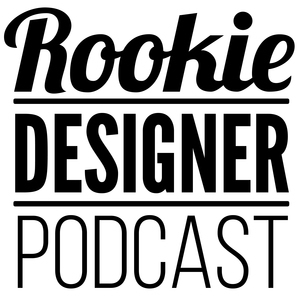 Jake and Carl are back with Rookie Designer episode 155! This episode they talk about some of the transitions they have been going through and how designers need to work through those transitions. They also touch on how some of those transitions have effected the show.